B2B stands for “Business to Business” and means trading between companies (unlike B2C where companies sell to customers). It can be wholesaler-to-retailer, supplier-to-corporation, manufacturer-to-distributor operations etc. Typically the parties operate big volumes, maintain long term relationships and it affects the way such websites function. There is no huge difference compared to B2C sites — there are still product catalog, orders, payment and shipping, but overall user experience is slightly different. Access to site. Usually the buyer need to register on the site and be approved by administrator before he can access the site. Sometimes visitors can access the catalog but don’t see the prices, sometimes they are forced to sign in. Prices. Often the prices are set for each buyer or buyer group separately – either on product level or on user level, or on both levels. For example, buyer A can order all products at 90% of regular price and buyer B — at 95%, or some specific product can cost $40 for one buyer group and $50 for another one. Also some products prices might be hidden or undefined and buyer would have to request a quote. Quick Order. If you are a wholesale buyer and buy regularly you may find it easier to be able to re-order the old orders, view all products on one page (instead of visiting multiple catalog/categories pages) and find them by SKU, edit the amount of each position in the offer quickly on one page. Payments. Very often the payments are processed outside of site and payment statuses are updated by administrator. Also there can be credit limits for buyers. Shipping. Shipping terms can usually be negotiable and defined on buyer level, and sometimes be product-specific (for example when large-sized items are sold and it requires unusual shipping method). In our opinion Magento capabilities for B2B are largely overlooked. It has all the essential features to set up a B2B website with no need for complex coding, let’s see what’s in the box. Private sales module allows you to restrict customers to certain areas of the site, show or hide prices, force users to register before viewing the site etc. It’s a built-in feature in Magento Enterprise and it also lets you create invitations for customers as well as events – a very flexible tool to offer time sales to privileged customers with a countdown ticker. It also allows to show upcoming events (“Add to cart” buttons disabled in this case). 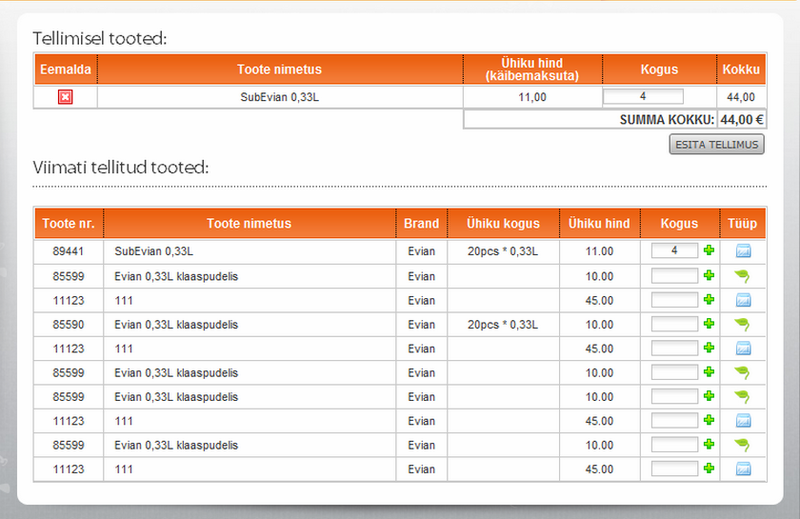 Most probably you want to run two stores on one Magento instance — a retail and a wholesale website. Use a “Website” scope while configuring the stores in the backend and you will have all the freedom to have separate catalogues, pricing, payment and shipping methods for both customer types. 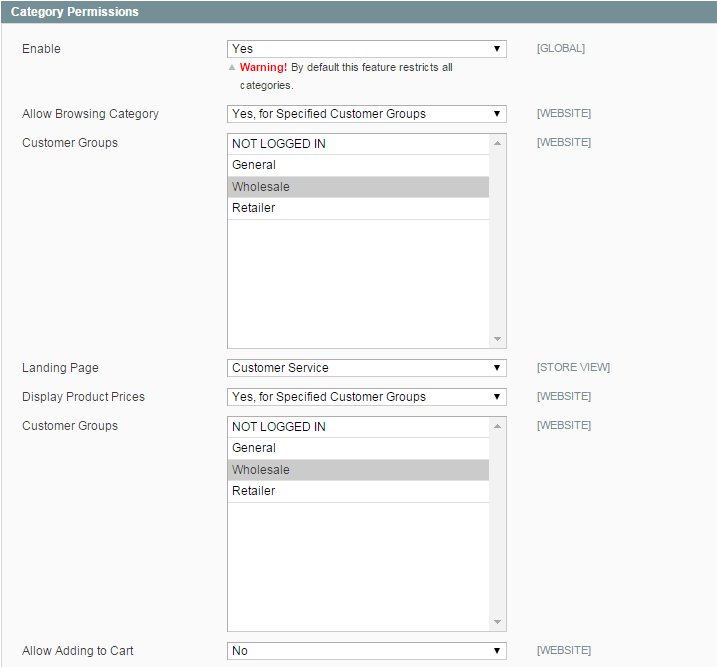 As mentioned above, Magento Enterprise has category permissions in its default configuration. Visibility of different products and prices can be managed with the use of Catalog Permissions ($89) or Customer Group Catalog ($79) for example. If you want to display pricing for everyone but show different numbers you can use Group Price feature — it’s default in Magento Community. Volume-dependent pricing can be set up using Tier Pricing feature (built-in). Since wholesale buyers, especially returning, usually know what stuff they need, they most probably know the specific SKUs too. To speed up the bulk ordering process you can use a quick order extension. Unfortunately, it’s not a default feature, but nothing extraordinary and is worth spending a few pennies. Fast Order ($79) allows searching for products by either SKU or name, Advance Quick Order ($65) also allows to import products to cart from a CSV. One more third-party module Cart2Quote allows wholesale customers to submit quote inquiries which can be turned into order upon admin approval. Reordering process is easily managed by a Re-Order option in My Account section. You might want to make it stand out more and look like a call-to-action button but the mechanism comes out-of-the-box. Payment by invoice is a default (mercifully) Magento feature too called Check/Money Order — no need for any customization unless you’ve got some extended requirements. Another payment option popular with B2B customers is credit limit. The idea is to configure how much a customer can spend on your site without paying the real money. You will need to add one more payment method because Magento CE doesn’t offer this feature, or use a ready extension like Customer Credit Limit by CedCommerce. Since shipping should be very flexible it’s better to configure it on per custom or per product level. Extensions like Shipping per customer group ($79) or Shipping Rules ($99) may come in handy. Both the workflow and the appearance of B2B systems differ from that of B2C. Don’t forget about the way your catalog looks and consider changing a conventional grid view to a list view with an ability to tick the checkboxes placed per product row or click some buttons that will instantly add products to the cart. As you might guess we have successfully implemented many B2B Magento sites and would be happy to help you to make your own one, as well as with any other aspects of Magento web design and development.